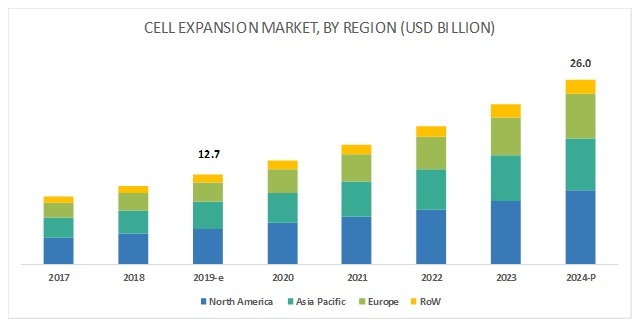 [171 Pages Report] The cell expansion market is projected to reach USD 26.0 billion by 2024 from USD 12.7 billion in 2019, at a CAGR of 15.4% during the forecast period. Growth in this market is largely driven by the rising global prevalence of cancer, growing awareness regarding cell-based therapies, and increasing government funding cell-based studies. On the other hand, the ethical concerns regarding research in cell biology is the major factor that is expected to restrain the growth of this market during the forecast period. On the basis of type, the cell expansion market is segmented into consumables and instruments. In 2018, the consumables segment accounted for the largest share of the cell expansion market. This is mainly due to its high demand during the production of regenerative medicine and rising research activities on stem cells in the biopharmaceutical companies. Apart from this, rising awareness regarding advanced treatment therapies such as personalized medicine is also another driving factor for this segment. Based on cell type, the cell expansion market is segmented into human cells and animal cells. The human cells segment includes stem cells and differentiated cells. These cells are used for therapeutic and research purposes. In 2018, the human cells segment accounted for the larger share of the cell expansion market majorly due to the increasing investments by public and private organizations for research on human cells such as stem cells, growing application areas of human stem cells, and the growing awareness regarding stem cell therapies. 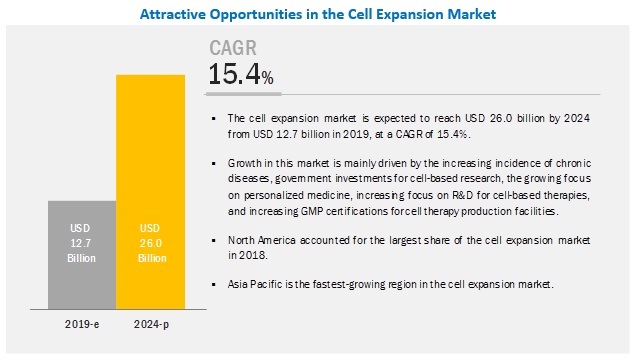 On the basis of region, the cell expansion market is segmented into North America, Europe, Asia Pacific (APAC, and the Rest of the World (RoW). While North America dominated the market in 2018, Asia Pacific is expected to register the highest CAGR in the market during the forecast period. Growth in the APAC market is largely driven by the large patient population and increasing focus of major players in this region. 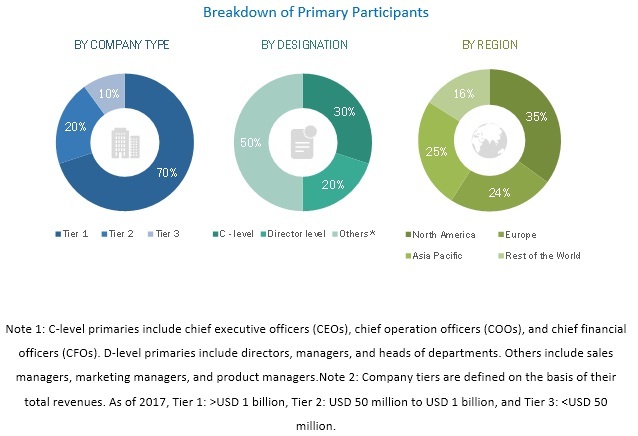 Prominent players in the cell expansion market include Thermo Fisher Scientific, Inc. (US), Becton, Dickinson and Company (US), Terumo BCT (Japan), Merck KGaA (Germany), Danaher Corporation (US), Miltenyi Biotec (Germany), Lonza Group Ltd. (Switzerland), STEMCELL Technologies Inc. (Canada), GE Healthcare (US), and Corning, Inc. (US). Thermo Fisher accounted for the largest share of the cell expansion market in 2017. The company mainly focuses on acquisitions and expansions to strengthen its position in the cell expansion market. In 2018, to expand its bioprocessing product portfolio, the company acquired BD’s bioprocessing unit for USD 477 million. GE Healthcare accounted for the second-largest share of the cell expansion market. The company mainly focuses on agreements and expansions to strengthen its business operations. For instance, in 2018, the company opened a biotechnology manufacturing center at the Stevenage Bioscience Catalyst Open Innovation Campus in Stevenage, UK. In 2018, Merck KGaA (Germany) entered an agreement with Incheon Free Economic Zone (IFEZ) to build an integrated cell culture facility in Songdo, South Korea. In 2018, Miltenyi Biotec (Germany) had received the European Medicines Agency (EMA) approval for the use of CliniMACS Prodigy instrument in MolMed S.p.A.’s GMP facility. In 2017, Beckman Coulter, Inc. [Subsidiary of Danaher Corporation (US)] Received 510(k) clearance from US FDA for its Navios EX flow cytometer. What are the growth opportunities in the cell expansion market across major regions in the future? Emerging countries have immense opportunities for the growth and adoption of cell expansion market. Will this scenario continue during the next five years? What are the various cell expansion product types and their respective market shares in the overall market? What are the new trends and advancements in the cell expansion market? * Business Overview, Exchange Rates, Products Offered, Recent Developments, and MnM View Might Not Be Captured in Case of Unlisted Companies. The study involved four major activities in estimating the current size of the cell expansion market. Exhaustive secondary research was done to collect information on the market and its different subsegments. The next step was to validate these findings, assumptions, and market sizing with industry experts across the value chain through primary research. Both top-down and bottom-up approaches were employed to estimate the complete market size. Thereafter, market breakdown and data triangulation procedures were used to estimate the market size of the segments and subsegments. After arriving at the overall market size-using the market size estimation processes-the market was split into several segments and subsegments. To complete the overall market engineering process and arrive at the exact statistics of each market segment and subsegment, the data triangulation, and market breakdown procedures were employed, wherever applicable. The data was triangulated by studying various factors and trends from both the demand and supply sides in the cell expansion industry. To track and analyze competitive developments such as partnerships, agreements, collaborations, acquisitions, product launches, and research and development activities in the cell expansion market. Thermo Fisher Scientific, Inc. (US), Becton, Dickinson and Company (US), Terumo BCT (Japan), Merck KGaA (Germany), Danaher Corporation (US), Miltenyi Biotec (Germany), Lonza Group Ltd. (Switzerland), STEMCELL Technologies Inc. (Canada), GE Healthcare (US), and Corning, Inc. (US).